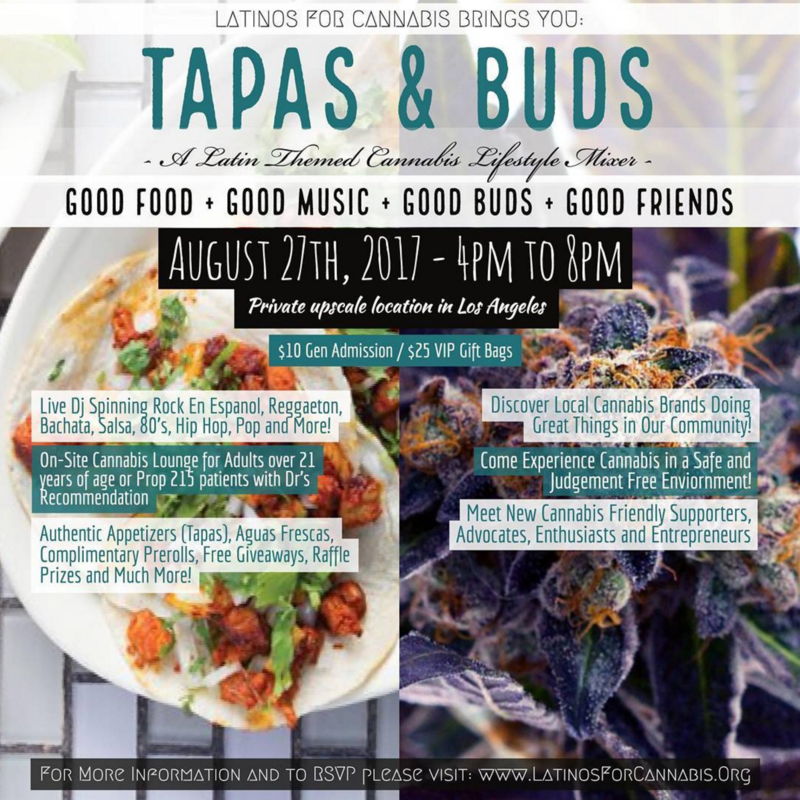 Come celebrate your love and affection for good food, good music, good friends and good Cannabis at our Latin themed cannabis lifestyle mixer @TapasAndBuds. Come experience a good time in a fun, safe and judgment free environment. Enjoy a variety of delicious and authentic tapas (appetizers) and aguas frescas and pair it with some fine Cannabis as we kick off a social mixer to bring our communities closer and help end the negative stigma associated with using Cannabis. We believe that the responsible use of Cannabis is a much safer recreational alternative that promotes Peace, Love and Connectivity! Live DJ spinning the best of Rock En Español, 80's, Bachata, Reggaeton, Hip Hop, Pop and more! Come Eat, Medicate, Dance and Socialize with likeminded individuals all connecting through Cannabis! Free giveaways, promos and a unique opportunity to meet local brands doing great things in our communities. Sponsors interested in participating in this event please email: TapasAndBuds@Gmail.com for sponsorship details.